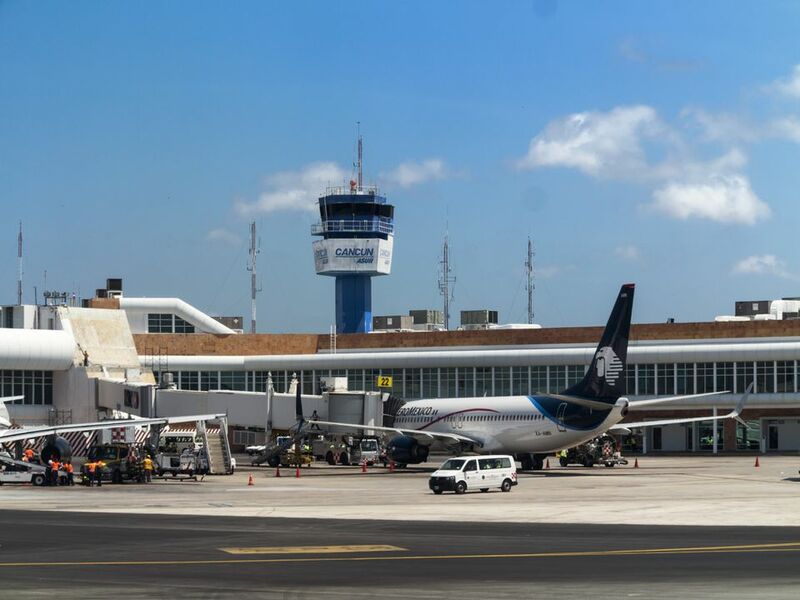 Cancun's International Airport is the principal gateway to Cancun and the Riviera Maya. The airport receives about 14 million passengers each year, making it the second busiest airport in the country after the Benito Juarez International Airport in Mexico City. In 2012 it was selected as the best airport in the Latin America/Caribbean region by ACI (Airports Council International) in their Airports Service Quality Awards. The Cancun airport has three terminals. Terminal 1 is used for charter flights. All scheduled domestic flights and some scheduled international flights come through Terminal 2, and Terminal 3 handles international airlines from North America and Europe. Terminals 1 and 2 are side-by-side and you can easily walk from one to the other. A shuttle runs from Terminals 1 and 2 to Terminal 3. You can find information about Cancun airport departures and Cancun airport arrivals info from Flightstats website. Within the airport, there is a large selection of restaurants, bars, and fast food outlets as well as a wide variety of shops. You will also find banks, ATMs and currency exchange booths as well as options for car rentals, and tourist information desks. Wifi: You can get 15 minutes of Wifi free with the Infinitum service - select "infinitum movil" from the list of WiFi signals and then click on your screen where it days "Si aún no eres cliente infinitum" and enter your information to sign up for free time. Alternatively, Mera restaurant in Terminal 2 (land side, before going through security) offers Wifi to clients. Ask your waiter for the password. After deboarding, if you have checked luggage, make your way to the luggage conveyor belt for your flight (flight information is displayed above), and collect your luggage. You will then need to pass through customs. During your flight you will have received a customs form (FMM) which you should have filled out before you land. You will present this form to the immigration official and they will determine how long you can stay in the country (maximum time for tourists is 180 days but you may be granted less time). After customs and before you exit the airport, you will pass through a hallway with desks and people offering tourist information and services. Many of these are timeshare salespeople, and they can be very pushy. They may call out to you and try to get your attention. It's best to just ignore them and continue on to the exit. It's best to have ve a transportation plan in place before your arrival. Cancun Airport is about a twenty-minute drive from the hotel zone, 45 minutes from Playa del Carmen, 90 minutes from Tulum and 2 hours from the Chichen Itza archaeological site. Regular city taxis are not authorized to pick up passengers from the airport, so you should choose one of the authorized transportation services. Ground transfers: Pre-arrange your transfer to your hotel in Cancun or the Riviera Maya through one of the many companies offering the service on the internet or through your hotel. A few companies that offer transportation service, both private and shared, are Best Day, and Lomas Travel which besides offering airport transfers also offers tours throughout the area. Renting a car: Renting a car is a good option for visits to Cancun and the Riviera Maya. Roads are generally in good condition and signage is ample. Get info about renting a car in Mexico. Bus Service: For a more economical option, the ADO bus company offers service to the center of Cancun, Playa del Carmen, or Merida. There are frequent departures between 8 am and 11 pm. Taxis from the bus station offer much more economical rates than those from the airport. The ADO bus ticket booth is located just outside Terminal 2. The airport is located just 6 miles from the Cancun hotel zone and receives flights from major international airlines as well as charters. Air Canada, Aircomet, AirEuropa, Air Tran, Air Transat, Alaska Airlines, Allegiant Air, American Airlines, America West Airlines, Amerijet, Atlantic Airlines, Austrian Airlines, Belair, Blue Panorama Airlines, CanJet, Condor, Continental Airlines, Copa Airlines, Corsair, Cubana, Delta, Edelweiss Air, Euro Atlantic Airways, Eurofly, Frontier Airlines, Global Air, Iberia, Iberworld, JetBlue Airways, KLM Northwest Airlines, LAB Lloyd Aereo Boliviano, LanChile, MagniCharters, Martinair, Miami Air, Monarch, North American Airlines, Northwest Airlines, Novair, Pace Airlines, Primaris Airlines, Ryan International Airlines, Skyservice Airlines, Spirit Airlines, Sun Country Airlines, Tam Airlines, Tikal Jets Airlines, United Airlines, U.S. Airways, Westjet.